BacteriophagesT2,T4, andT6 were among seven Escherichia coli phages selected by Max Delbrück to study fundamentals of viral replication in a limited number of model viruses. These studies led to the first formulation of many concepts that are now accepted foundations of molecular biology: the fundamental differences between growth of viruses and cells (figure 18-1) (109); the demonstration that nucleic acids of virus particles suffice to establish infection and to direct synthesis of complete virions (163); the concept of the gene, including distinctions between units of recombination, mutation, and function (30); genetic recombination as exchange between DNA molecules involving "heterozygous" overlaps (91,164,165); the demonstration of messenger RNA (mRNA) (55, 414) and the non-overlapping triplet code (83, 390) with nonsense triplets as termination signals (31); the repair of DNA damage in the light (103) and in the dark (149); restriction and modification of DNA (247); the presence of spliced and nonspliced introns in prokaryotes (25, 171); the definition of pathways leading to the assembly of complex macromolecular structures (105); and the importance of protein complexes (machines), which change composition during various DNA transactions (9, 275). Many other phages from different parts of the world are classified within this family, based on similar sequences and map positions of their essential genes, regulatory patterns, virion structure and serological properties. 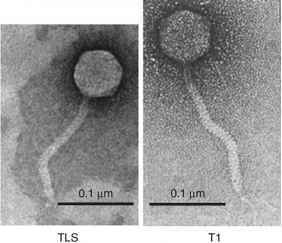 They are now collectively called the "T-even" phages (192). More distantly related phages have been called pseudo-T-even phages (2, 13, 148, 266, 397) or schizo-T-even phages, although the criteria that distinguish them are ambiguous. These phages infect many different Gram-negative bacteria in various environments, from mammalian intestines to marine cyanobacteria and other bacteria. The genomes of the T4-related phages are contained in large (~170,000 kb), linear, double-stranded (ds) DNA molecules whose termini contain repetitions of approximately 3% of the genome. The termini are randomly permuted over circular maps (figure 18-2) (273, 276, 289, 388,389, 399). The DNA of most T4-related phages contains hydroxy-methylcytosine (HMC) instead of cytosine. In most members of the family, the HMC residues are further glycosylated to different extents. These modifications together allow escape from host and phage restriction enzymes and are important for the developmental strategy of these phages. DNA is packaged in elongated "heads" of quasi-icosahedral symmetry. DNA-filled heads are joined to independently assembled tails whose baseplates and fibers (figure 18-3) are instrumental for recognition, adsorption, and injection of the DNA into host bacteria. Different phages recognize different receptors in different host strains. Apparently, recombination within their genomes or with genomes of plasmids and other phages or pro-phages facilitates rapid evolution of T-even tail fiber genes and adaptation to different hosts (156,396,397). T4 can grow well in many other Gram-negative bacteria if the bacteria are converted to spheroplasts and the phage are treated with urea (416). The urea circumvents the first adsorption stage (and host specificity) by altering the baseplates and tails of the phage particles so they can release their DNA into spheroplasts upon contact with bacterial inner membranes. The final injection of DNA requires membrane potential (135). Figure 18-1 Overview of the T4 life cycle. Modified from (253). has greatly contributed to general understanding of these processes. Nevertheless, like all viruses, T-even phages depend for their propagation on many vital structures and functions of their hosts, such as membranes, energy metabolism, tran-scriptional and translational machines, and some chaper-ones. They manage to usurp host structures and functions in an exquisite choreography that allows adaptations to different environmental conditions, including the different physiological states of the host. T4 is the most thoroughly investigated member of the T-even phages, mainly because the isolation of a large collection of conditional lethal mutants (110) provided a powerful impetus for molecular analyses by biochemical and biophysical methods. The results of the combined efforts of many research groups working on T4 and related phages are summarized in a monograph (192) and in a recent review that emphasizes bioinformatic aspects of the annotated T4 genome (262). 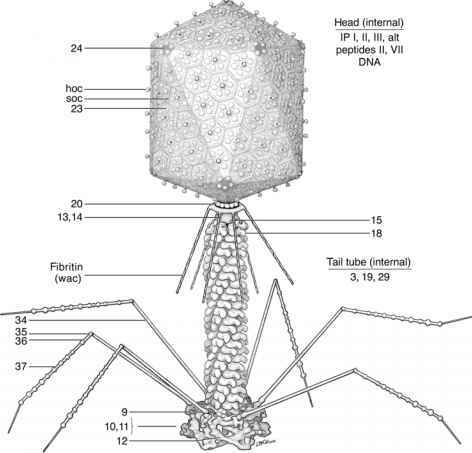 Comparisons with other members of this phage family have been reviewed (87, 225, 226, 266) and will be extended as sequences of other T4-related phages are being published. References cited here are mainly to summarizing chapters in (192) and to papers published since then. We emphasize that the recipe for T4's success as a molecular parasite is based on multiple redundant pathways for most, if not all, physiologically important DNA transactions: transcription, translation, replication, recombination, repair, and packaging. These pathways are interconnected at many levels (figure 18-4). Many of the cross-connections are promoted by certain proteins that can participate in different complexes and pathways. This allows communication between different pathways and their adaptation to different environmental conditions. The redundancies are most likely also important for evolution. However, for the sake of clarity, we discuss these different pathways and their regulation during phage development separately, after this overview. Figure 18-2 T4 gene maps. The outer circle shows the approximate positions of characterized genes on the 169,903 base pair DNA, drawn as a circle. The next three genome segments show three maps derived from determining distances of chromosomal ends from rl, rll, and rill respectively (278). Note that the relative length of the small rl molecules was 0.77, not 0.68 of the normal T4 chromosome. 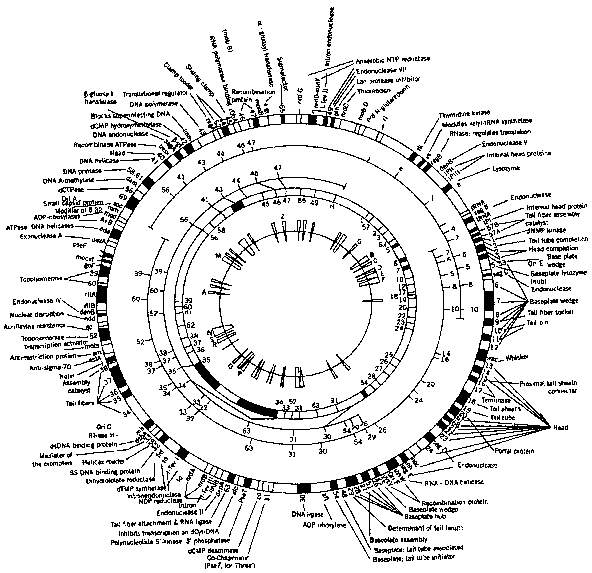 The next (full) circle indicates the positions of genes derived from genetic crosses (105). The innermost circle indicates the positions of heteroduplex loops after annealing of heat-denatured T2, T4, and T6 DNA (201). transcription, connecting these two processes. The classification of transcripts is complex, as described below, largely because most genes are transcribed from multiple promoters, and protein synthesis is affected by subsequent translational controls. 2. RNA processing by phage and host enzymes, trans-lational repressors, and poorly understood modifications of ribosomes all modulate T4 gene expression (69, 261). No transcriptional repressors (in the original meaning of the word) are known. Most likely, post-transcriptional modulators, including translational repressors, are more suitable than transcriptional regulators for adjusting to rapid physiological changes during the short T-even development: one growth cycle is completed in less than 30 minutes at 37 °C. 3. The host DNA and host mRNA, present at the time of infection, are rapidly degraded, and the breakdown products are efficiently reused to synthesize phage DNA and RNA. Figure 18-3 Structure of the T4 virion. Image is based on negative stain and cryo-electron microscopy, and crystallographic data. The locations of the protein components are indicated by gene number. The portal vertex composed of gp20 is attached to the upper ring of the neck structure, inside the head itself. The internal tail tube is inside the sheath and itself contains a structural component in its central channel. The baseplate contains short tail fibers made of gp12; these are shown in a stored or folded conformation. subsequent T4 replication is entirely phage-controlled, escaping the host's controls. It depends on phage-encoded replication and recombination proteins and on primers that are intermediates of homologous recombination, thereby connecting replication, recombination, and repair of DNA (82,217,218, 277). 5. During the later stages of development, proteins involved in packaging DNA become also important for DNA replication, thereby coordinating these two processes (290). The genome of T4 resides in 169,903 base pairs (bp) of dsDNA containing glucosylated HMC residues (262). The HMC residues are glycosylated to different extents in different T-even phages. 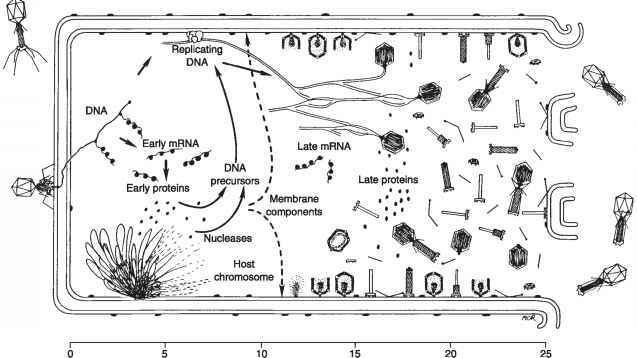 The complex modification and restriction of T4 DNA, further discussed later in this chapter, can best be rationalized as the result of an ongoing evolutionary process that includes exchanges between the phage, its host, and prophages and plasmids resident in the host. Most T-even phages destroy dCTP, synthesize dHMCTP, and use the latter for their own DNA synthesis. Using genetic tricks, T4 mutants containing unmodified cytosines in their DNA have been isolated (68, 228). Their DNA has been instrumental in cloning and sequencing the T4 genome, but the lack of modification affects restriction and regulation of transcription termination (98), and limits viability and host range (338). Moreover, as discussed below, origin initiation of DNA replication (439) and packaging (241) appear to be different from that of wild-type T4. Figure 18-4 Diagram of the relationship between the T4 transcriptional pattern and the different mechanisms of DNA replication and recombination. The upper panel shows the transcripts initiated from early, middle, and late promoters by sequentially modified host RNA polymerase. Hairpins in several early and middle transcripts inhibit translation of the late genes present on these messengerRNAs. The lower panel depicts the pathways of DNA replication and recombination detailed in this chapter. 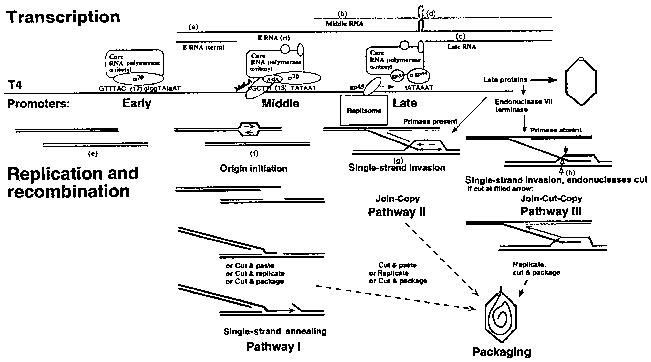 Hatched lines represent strands of homologous regions of DNA and the arrows point to possible positions of endonuclease cuts. Replication can be only initiated from cuts marked by filled arrows. Cuts indicated by open arrows cannot be used to initiate replication forks. Modified from (279). Mature T4 DNA molecules (chromosomes) packaged into virions are linear. In contrast, intracellularly replicating DNA contains multiple covalently linked copies of the genome, called "concatemers" (117, 399), which are highly branched as a result of recombination and replication. These concatemers are cut during packaging (see below) at nearly random positions of the circular map (figure 18-2). Because the heads are filled with DNA corresponding to approximately 103% of theT4 genome, processive packaging generates the circular permutations of chromosomal ends (388) and ensures that each chromosome is diploid for more than 5000 bp at the ends (so-called terminal redundancies). The terminal redundancy allows homologous recombination between two terminal regions of the same chromosome and recombination-dependent DNA replication (85, 280) after infection of bacteria with a single phage particle. Numerous mutations, and their assignments to complementation groups and open reading frames (ORFs), have defined approximately 160 proteins with known functions (table 18-1). More than 120 additional ORFs of unknown function can be deduced from the DNA sequence (262). Most, if not all of these ORFs are transcribed, and some of their protein products have been detected by polyacryl-amide gel electrophoresis. There are many overlapping coding regions; several genes direct synthesis of more than one protein from in-frame or (in two cases) out-of-frame internal start codons; many ORFs are very small; and in at least one region (replication origin E) both complementary DNA strands encode proteins. In spite of the large genome size, only a few short regions are devoid of coding capacity. These and other observations suggest that apparently redundant and "nonessential" genes confer selective advantages. In contrast to many other phages (e.g., the lambdoid and T7-related phages; chapters 27 and 20),T-even early and late transcription units are not clearly separated but are inter-digitated (e.g., late genes 26, 25 and the middle gene uvsY). Most genes are transcribed from multiple promoters, and genes for related or interacting proteins are not necessarily clustered (a most striking example is genes 5 and 27, which code for the first interacting baseplate components; 187). Moreover, the direction of transcription does not unambiguously distinguish between early and late genes. In fact, in many cases early and late genes are cotranscribed (291) (figure 18-4). In this respect as well as in the amino acid sequences of some of their proteins (e.g., DNA polymerase and terminase), the T-even phages more closely resemble the herpesviruses than certain other phages.